Shō-Kannon represents the primary form of the bodhisattva of compassion. Seated on a lotus blossom, he holds a lotus bud in his left hand and his right hand forms a mudrā across his chest. 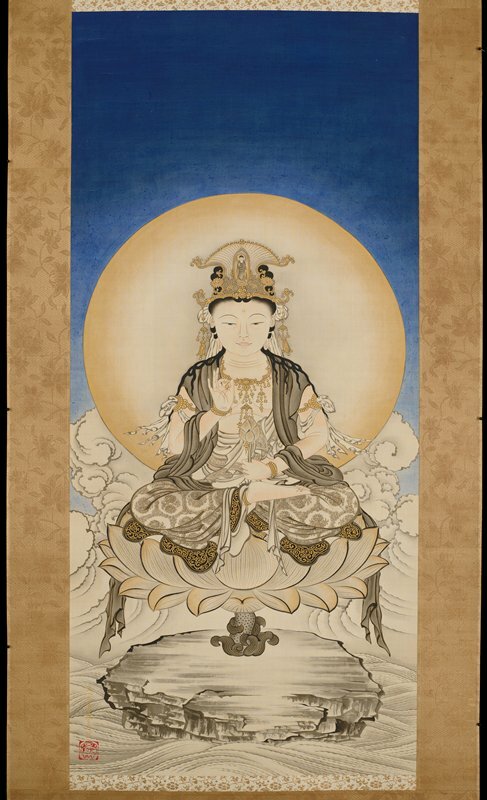 Encircling Kannon’s head and torso is a moon-like halo set against a deep blue sky that recalls Kiitsu’s Moon and Waves, also in this exhibition. Kiitsu was part of the Rinpa school revival in Edo, which was led by his teacher, Sakai Hōitsu. Though the primary motifs of Rinpa painting are scenes from nature and classical literature, Kiitsu deftly applies the school’s graphic style to Buddhist iconography.